Fitness experts spend so much time thinking about how to motivate people to go to the gym that often the fact that not everyone has a good gym to go to gets overlooked. Rather than drain your wallet and clutter your home with exercise equipment (that might just end up collecting dust, anyway), Peter Walsh, author of Lose the Clutter, Lose the Weight, with Liz Davis, MS, trainer, bodybuilder, and exercise physiologist, say you can create your own gym with items you already have at home. Stand with one foot in front of the other, feet about 2 feet apart, while holding a milk jug in one hand. Use the other hand to support yourself by placing it on your thigh. Keeping your knees slightly bent and your upper body straight, lean forward at the hips roughly 45 degrees. Extend your hand down toward the floor at chest level. Slowly pull your elbow back behind your body, bringing the object in your hand up to the side of your chest. Squeeze your shoulder blades together during this motion. Lower the object back down and repeat as necessary. Switch sides and perform the exercise on the other side. Stand upright with your feet shoulder-width apart. 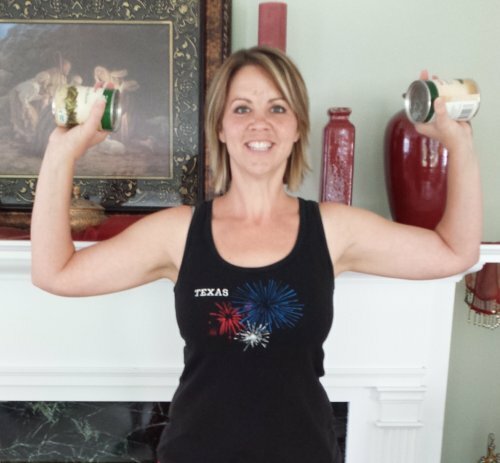 You can do the exercise empty-handed or hold a soup can or other object in each hand. Begin with your hands up even with your ears, with your elbows bent at roughly 90 degrees. Press your hands up and over your head until your arms are straight up but your elbows aren’t locked. Lower your hands down until your elbows are once again bent at roughly 90 degrees. As you do so, squeeze your shoulder blades together. Repeat as necessary. You know what a workout schlepping a heavy bag around an airport can be, so bring that same hard work home. Replace a bulky barbell with a sturdy duffel bag filled to your comfort level, and use it for biceps curls. Stand with your feet close together. 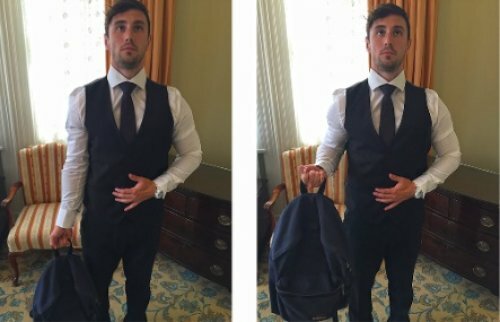 Hold the duffel bag in front of you with both hands, with your arms extended toward the floor and your palms facing up and away from you. Lift your hands upward toward your chest, holding your elbows stationary at the sides of your abdomen. Avoid leaning back as you lift the duffel bag. Lower your hands back down and repeat as necessary. 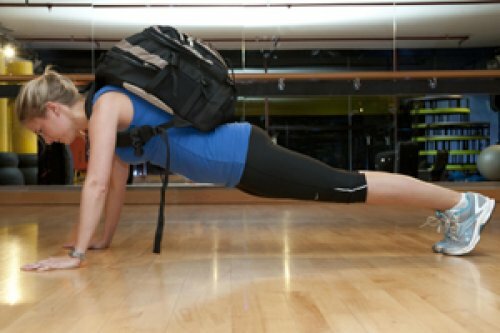 You can also do this exercise holding the duffel bag handles with one hand and curling the bag with one arm.